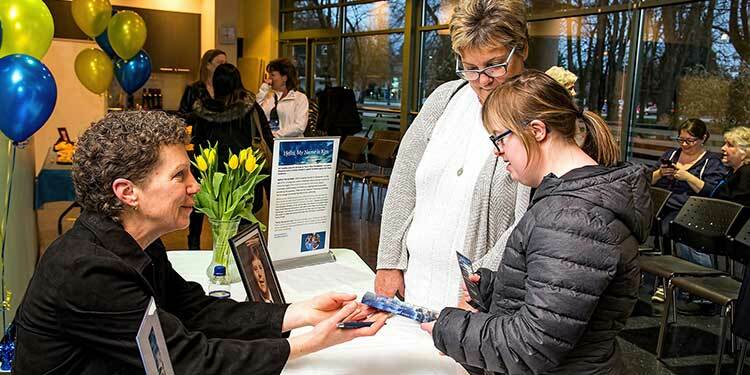 Author Diana Frizell offers a signed copy, to 24-year-old Katelyn McPhedrian and her mom Lisa at the March 21 launch of Hello, My Name is Ken. There’s a new book out, just launched on March 21 at the Richmond Cultural Centre, in a room festooned with blue and yellow balloons, Hello, My Name is Ken. Amongst bouquet of daffodils, author Diana Frizell sits at a table signing her book chronicling the vivid life and eventual death of her brother, Ken Frizell, a man who lived his whole life in Richmond. “Ken was a Down Syndrome fellow,” Diana says. “He was 15 months older than me so we kind of grew up like twins. Because of his developmental pace, we kind of grew up together. It’s not like I blew past him. Diana sounds perplexed when she describes some people’s reaction. The first half of Diana’s book chronicles Ken’s life in his family, his school—Richmond High where he won the drama prize in Grade 12, and his community where he was an enthusiastic sportsman and worker, holding down a variety of jobs. “The reason I wrote the story is that he was this amazing guy all his life. As with all people with Down Syndrome, they are predisposed to Alzheimer’s Disease. He was unfortunate enough to get it,” Diana says. By age 50, fifty percent of people with Down Syndrome will have Alzheimer’s. For everyone else at that age, without a rare, and likely inherited, disposition to early on-set Alzheimer’s Disease, their dementia risk is very low. Alzheimer’s Disease is one kind of dementia. At first, at age 48, there were small problems with Ken’s leg; it wouldn’t work properly and would sometimes hurt but Ken, while highly verbal, didn’t have a way to describe what was happening to him. Then Ken started to have big problems. He had trouble speaking. Many health care professionals, unfamiliar with the wide range of abilities people with Down Syndrome have, didn’t realize these were new problems for Ken, that he had once functioned very well, at home and in the community. Part of Diana’s reason for writing the book is to educate others so they can learn the difference between a healthy person who happens to have Down Syndrome and someone with Downs who has dementia. “That’s why it’s important to get the message out because I was his sister. I am only 15 months younger and I knew him so well. It’s very different from what a parent or a professional might know,” says Diana. Then, one day, Ken had a grand mal seizure, the first epileptic episode of his life. The medical professionals took notice. The diagnosis came; Ken had early-onset dementia, likely Alzheimer’s Disease. Diana said her family tried to help Ken cope with his declining abilities. She tells of how Ken’s Downs complicated their ability to get care, of how it was hard to know what to do or where to go. Her parents, now Ken’s main caregivers, had to cope with an adult who, for the first time in his life, was sullen and sometimes angry with frustration. Living and working in Victoria as a financial advisor for Coast Capital, Diana came home to help out whenever she could as did Ken’s older brother and his wife who had a family and jobs of their own. Most of the care fell to Ken’s parents. There were no resources for people with Downs and dementia, no one they could turn to for suggestions. Then one bright light arrived; one day a week Ken went to adult daycare. How did adult daycare go? Diana saw it with her own eyes. Within a few years of diagnosis, Ken’s ending came as kindly as he lived. “The palliative care ward of Richmond Hospital, they were the most compassionate part of the whole process,” Diana says. She names, with gratitude, the stand-outs in Ken’s care team, Beth and Dr. Alexiadis. All money beyond the bare cost of the book goes to the Ken’s Place Foundation.